Heat grill to medium high heat, if using a grill pan rub 1 tablespoon of butter to pan. Cut peaches along the seam and twist off pits. Brush the peaches with a little oil and place on the grill, cut side down. Cook for about 3-4, or until peaches start to show the grill marks. Turn peaches over and cook 2-3 more minutes. 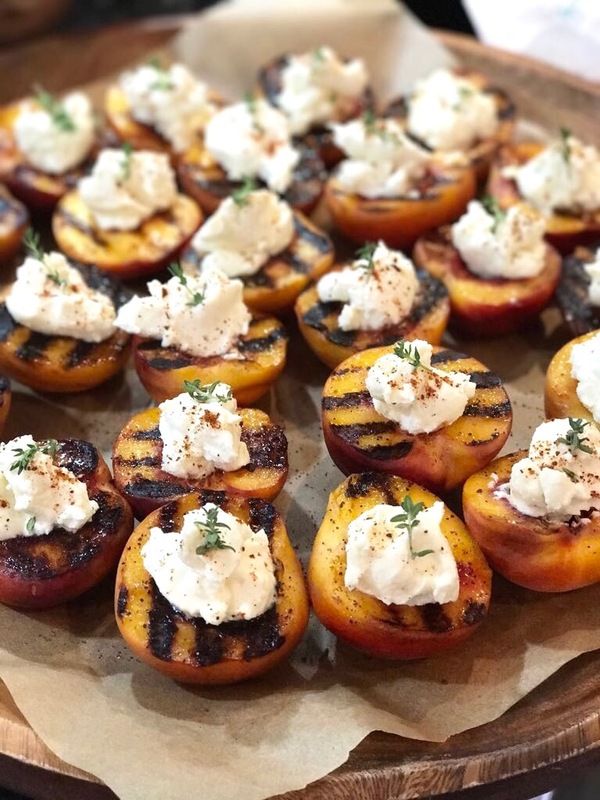 Remove from the grill, season with salt and pepper, drizzle a little olive oil and fill with maple infused ricotta and finish with a little sprinkle of prosciutto dust. Slowly bring milk, cream, and salt to a rolling boil in a large heavy pot over moderate heat, stirring occasionally to prevent scorching until it reaches 195 degrees (about 12-15 minutes). Add lemon juice, then reduce heat to low and simmer, stirring constantly, until the mixture curdles (about 2 minutes). Pour the mixture into the lined sieve and let it drain 1 hour. After discarding the liquid, separate the ricotta in two bowls (one for savory ricotta to use for pasta, pizza, sandwiches… and the other for the maple infused ricotta). For the savory ricotta, taste and add olive oil and salt if needed and for the maple infused add the maple syrup and stir well. Ricotta will keep in the refrigerator 4-5 days. Place 5-6 prosciutto slices in a single layer on a large baking sheet and bake until dried and crisp, about 1 hour. Cool to room temperature and grind in a spice grinder.